The wallpaper collection Marstrand II – Coastal Living is inspired by the beautiful views and magical light found on Sweden’s coast. The wallpaper has a natural colour range and depicts classic features of life on the coast including lighthouses, knots and classic stripes. The collection will be launched in mid-April. 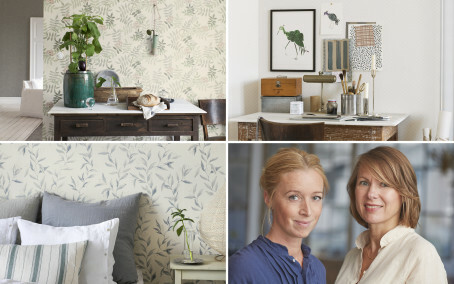 Boråstapeter launches Linen Second Edition. A collection of single coloured wallpapers with a continuous Linen texture to give rooms a still shimmer and a soft textile feel. 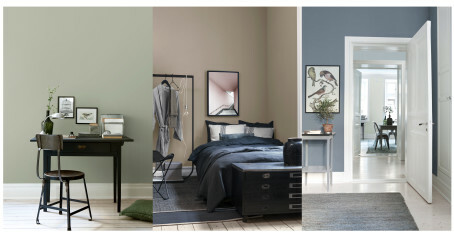 Second Edition consists of 36 colour settings and is the sequel to Boråstapeter’s first Linen collection which, since its launch in 2015, adorns tens of thousands of walls worldwide. Oriental Dreams is a versatile and exclusive wallpaper collection inspired by the Far East. The collection consists of eleven designs, ranging from delicate looping floral patterns to majestic, shimmering gold medallions. It’s an ideal collection for warm, homely and personal interior styles. Newbie, KappAhl’s lifestyle concept of sustainable fabrics for babies and children, is launching new lines. 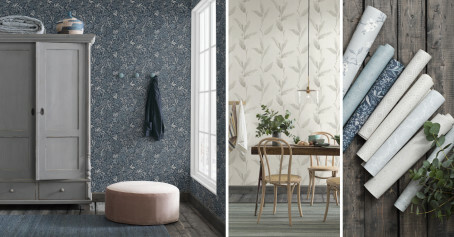 A mini series of wallpapers featuring Newbie’s hand-drawn patterns has been designed and developed in collaboration with Boråstapeter, the prestigious Swedish wallpaper house. It is simultaneously releasing a limited edition of bedclothes in matching patterns. 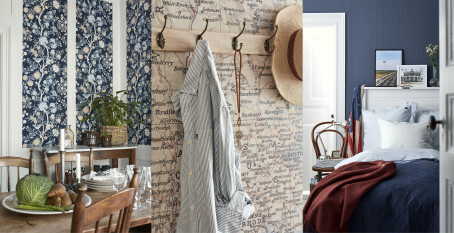 In their latest collection, Northern Stripes, Boråstapeter have built on the Swedish tradition of striped wallpaper. With a variety of stripe patterns to suit every taste, Northern Stripes complements both contemporary and classic interiors. Boråstapeter are launching their latest collection, ‘Billie’. This affordable wallpaper collection offers contemporary styling with Easy Up quality. With its on-trend, eye-pleasing patterns, Boråstapeter aim to give everyone the opportunity to create a more beautiful home. 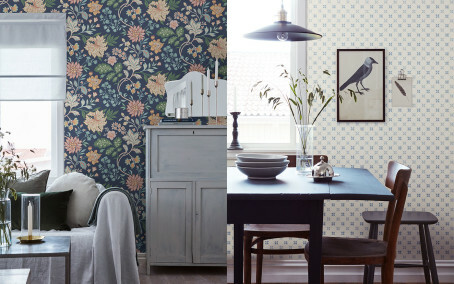 The wallpaper collection, In Bloom from Boråstapeter, captures flowers shining in all their splendour and diversity. Depicting everything from classic roses and trendy peonies through to wild bouquets, the collection has been awarded Plaza Interiör’s design award for Wallpaper Collection of the Year, 2018. Boråstapeter launches In Bloom. Without us even thinking about it, nature has a profound effect on all our lives. All year round we’re reminded of our fundamental need to be connected to the natural world – a need that is perhaps most beautifully expressed through our love for flowers. Boråstapeter launches Anno. 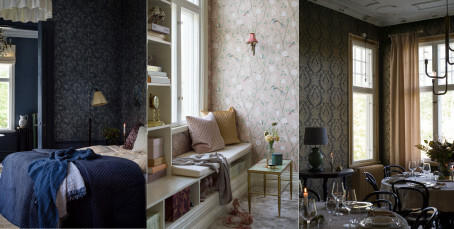 A Wallpaper collection that brings together a cultural history of wallpapers from the 1500s to the 1930s. Boråstapeter are keen to preserve this cultural heritage. Anno, is therefore de ned by our history of style for new generations. 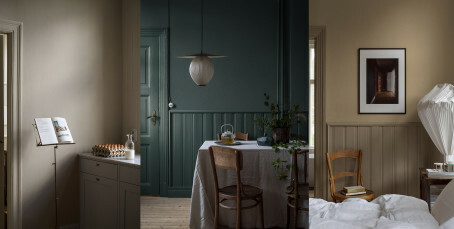 Matt, silky and strikingly simple, Pigment is a collection of single-colour wallpapers characterised by carefully selected colours in classic tones. Understated and visually harmonic, the collection is a perfect balance of traditional minimalism and current and upcoming design trends. 2018 is going to be a colourful year, according to Boråstapeter. 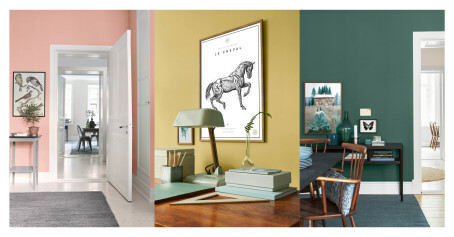 The company is launching its Deep Sea Dive serie – a selection of wallpapers that highlights 2018’s biggest trends in colours. The trend serie, available for a limited time only, consists of ve single-coloured wallpapers with a matt, velvety nish. BOROSAN – 120 New reasons to wallpaper like a professional. Borosan from Boråstapeter offers outstanding sustainability characteristics and is easy to work with. Presented in a versatile and attractive range of patterns, colours and styles, the collection’s classic-contemporary feel makes it ideal in rooms of every size and character. 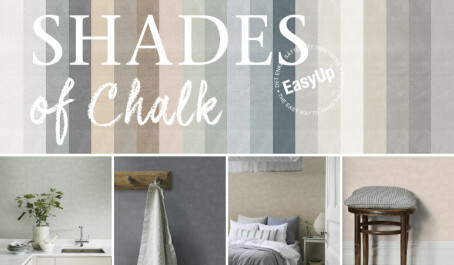 Shades of Chalk is a harmonious and soft surface pattern with a feel of limewash painted with soft, broad brush strokes. The limewash surface is hand-painted by Boråstapeter’s design studio to ensure it feels honest and authentic. 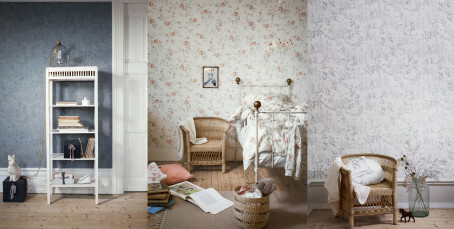 This is a collection for anyone who wants to add depth and tranquillity to a room, but prefers to use plain wallpaper. 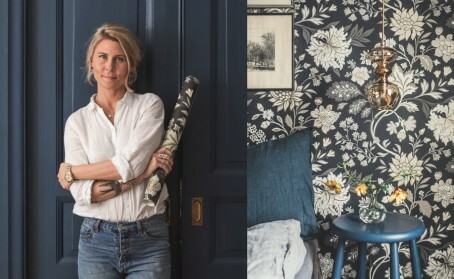 Well-known blogger and photographer Kristin Lagerqvist – the person behind the lifestyle blog Krickelin – has opened up her home with Boråstapeter to show just how easy hanging wallpaper can be. 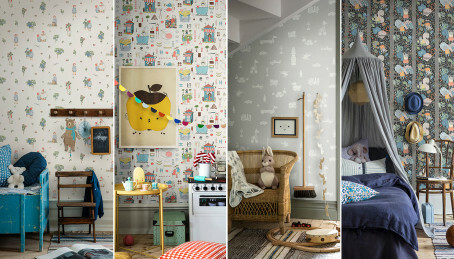 Just in time for spring, Boråstapeter is launching a decorative collection of hand drawn wallpapers with both light and colourful elements set to inspire people living in both cities and the countryside to decorate with a homely, countryside atmosphere. A blue-striped work shirt, windswept sun-bleached wood, natural materials such as leather, linen and stone and a relaxed East Coast lifestyle are the sources of inspiration for Boråstapeter’s classic New England collection, developed in collaboration with Lexington. 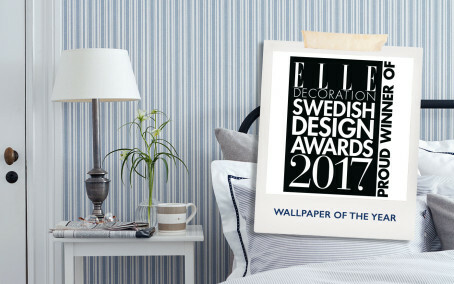 The collection has now been commended by the Elle Decoration Swedish Design Awards. Instinctively, your hand reaches out to caress the designs and connect with the craftsmanship, the brush-strokes, the delicately sketched lines and gently distressed effects that create the kindly warmth of the designs in the Soft Feelings collection. “All the designs are drawn or painted by hand to add a gentle tactility to the interior”, explains Sissa Sundling, Head of Design. A blue-striped work shirt, windswept sun-bleached wood, natural materials such as leather, linen, stone, sand and sea, and a relaxed East Coast lifestyle are the sources of inspiration for this classic New England collection.